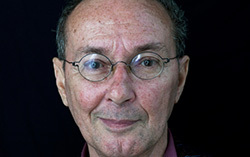 Pim de la Parra was born in Suriname in 1940. After studies at the Dutch Film Academy in Amsterdam, he began making films in Holland in the 1960s. He is a writer and director, known for Paul Chevrolet and the Ultimate Hallucination (1985), De nacht van de wilde ezels (1990) and Lost in Amsterdam (1989). Wan Pipel, his first film in Suriname, was also the country’s first feature film. In 2008 he received a Golden Calf award from the Dutch Film Festival, in honour of his career in filmmaking. Retired from filmmaking and lives in Suriname.